This picture of Si Frumkin inspires me. Today when Jewish groups rally to Israel’s aid, we are lucky if there is an inspiring word said. Ok, perhaps that is an exaggeration. But between the ambivalence of the Jewish community over Israel’s use of force in defending herself, and the Jewish communities fear of attracting too much attention from the Gentiles, Israel rallies on the West Coast are not what the Soviet Jewry Rallies of Si’s generation were. I am hoping to change that. Stay tuned. Si Frumkin, a survivor of Dachau and a prominent Los Angeles textile manufacturer, heard the question and it reminded him of the days before the Holocaust. 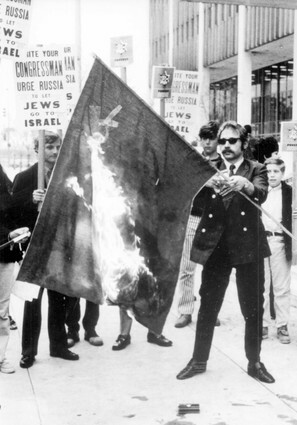 A man of direct action, Frumkin founded the Southern California Council for Soviet Jews in 1968 and over the next two decades would not leave the issue alone. For years his inventive activism could be found in protests at a variety of Soviet cultural events. Frumkin, who did more than anyone else in the United States to focus attention on the struggle of Soviet Jews, died Friday of cancer at Providence Tarzana Medical Center. He was 78.